The Club acquired Keep Rolling privately in early summer 2017 from famous Irish point to point man ‘Farmer’ Doyle. The Club bought Keep Rolling unraced when the ground went against him and prevented him beginning his racing career in an Irish maiden point. He is a four year old gelding by Mahler, a top class Coolmore stayer on the flat, who won the Queen’s Vase and was second in the St Leger and third in the Melbourne Cup. Mahler has sired a number of good National Hunt horses, including Sutton Place, to whom Keep Rolling is closely related. Sutton Place, owned by J P McManus, has won five of his six starts over hurdles including Group 2 and 3 victories. Keep Rolling’s maternal grandsire Good Thyne was a prolific sire of successful National Hunt horses. Keep Rolling is a big and handsome chestnut, who has come on very well under Chloe’s care. 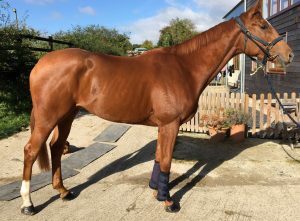 He is now at the Hobbs yard and should make his racecourse debut before Christmas, probably in a maiden hurdle.